On its 40th anniversary, productronica featured plenty of innovations including augmented reality, robotics in electronics manufacturing and the productronica innovation award. Some 38,000 visitors from nearly 80 countries took part in the World’s Leading Trade Fair for Electronics Development and Production. The share of visitors from Asia was up considerably. Rainer Kurtz, Chairman of productronica’s Technical Advisory Board, CEO of kurtz ersa and Chairman of the VDMA Electronics, Micro and Nano Technologies (EMINT) Association, sees positive signals for the industry: “There are so many opportunities to drive our business forward. Industry 4.0 is a new market with a great deal of growth potential. And in automotive electronics, all the driver assistance systems are giving electronics production a considerable boost.” The latest figures from a VDMA survey about the business climate verify that. According to studies, growth rates of approximately 15 percent are expected between now and 2018—among other things due to Industry 4.0, the automotive industry, wireless network technologies and mobile communication. According to a survey by market research institute TNS Infratest, 93 percent of visitors said that productronica met their expectations regarding innovations. Some 38,000 visitors from nearly 80 countries attended the trade fair in Munich—roughly the same high level as in previous years. According to a survey by market research institute TNS Infratest, visitor satisfaction is very high: 97 percent of visitors gave the fair a rating of good to excellent. The sharpest increase in attendance was the number of visitors from Asia—and from China, Japan, Malaysia and Singapore in particular. After Germany, the countries with the largest number of visitors were as follows (in this order): Italy, Austria, Switzerland, the Czech Republic, the Russian Federation and Great Britain. Of the more than 70 submissions, awards were presented to the following winners in five cluster categories: Fuji Machine in the PCB & EMS cluster, Rehm Thermal in the SMT cluster, F&K Delvotec in the Semiconductors cluster, Schleuniger in the Cables, Coils & Hybrids cluster, and Asys in the Future Markets cluster. IT2Industry, the Exhibition and Open Conference for Intelligent, Digitally Networked Working Environments, was held in conjunction with productronica for the first time ever. The final report for IT2Industry is available in German on the website. The trade fairs productronica and electronica are held in alternating years, making Munich the most important place for the electronics industry to meet. • The next electronica takes place from November 8 to 11, 2016, and the next productronica takes place in Munich from November 14 to 17, 2017. 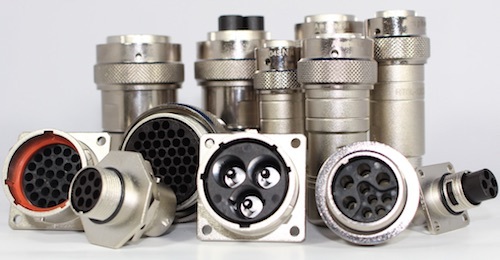 “Were you made for me?” – Choosing the right connector spec. Connectors come in all shapes and sizes depending on environment and application. There are literally thousands of options, sometimes for the same job. Inevitably, this can cause a lot of confusion. To make sure you find the best product for every job, there are a few questions you might want to ask yourself before making a purchase. Here Amy Wells, business development manager at Electroustic poses the questions you need to be asking when specifying a connector. First things first, size matters. Do you know the physical size of the connector you need, or are you limited in space and height by the job? Hundreds of connectors are used in wire looms; perhaps even thousands if these are part of an automated manufacturing line. In each case, the requisite space needs to be analysed and the correct connector specifications chosen. Sounds simple, but you’d be surprised how often people come a cropper. The next question you need to be asking yourself is how many poles the connector needs. Different applications require connectors with different poles. Future-proofing your choice can be a good idea, especially for a new product. So it’s worth considering whether you should go for more poles than originally required. Furthermore, connectors in particularly harsh environments – like those in the oil and gas industry – need to be up for the job at hand. Knowing the minimum and maximum operating temperature is essential for specifying a rugged connector that meets the temperature range set by the application. It’s not just the connector’s specs you have to be aware of when planning a job. Lead times from manufacturer to supplier can be lengthy, running from anywhere between four to sixteen weeks. It’s no good specifying a part that has a typical 16 week lead time if it will hold up the production process. To combat this potential issue, a good distributor will always hold a substantial amount of stock on the shelf. Speaking of distributors, they will also be able to advise you on cost effectiveness. When crafting wire looms, connectors are ordered in bulk, with the resultant savings passed on to the customer. However, if you need just one connector – perhaps if it’s a specialist part – you won’t be quite as lucky. A good working relationship with an experienced distributor can result in alternatives being sourced for a fraction of the price. Finally, as any lifestyle magazine will tell you, compatibility is paramount. If you’re retrofitting new connectors to old or simply mating two together in a loom, they need to be intermateable. If not, you risk damage to the system and or data/power loss. Testing in 2014 – looking forward! National Instruments has released its Automated Test Outlook 2014, highlighting the company’s research into the latest test and measurement technologies and methodologies. Engineers and managers can use the report, which examines trends affecting a wide range of industries, to take advantage of the latest strategies and best practices for optimising any test organisation. The talent pool for test engineers is shrinking and test managers must improve organisational proficiency through smarter hiring, better onboarding and greater investment in training to ensure a properly skilled and staffed test organisation. New technologies deliver greater feature sets on test equipment, helping test managers monitor the health of their test systems, lowering test costs and maximising uptime. Traditional test frameworks limit profitability by not providing the ideal balance of performance and cost or the ability to scale based on actual product demand. Similar to the IT industry, cloud computing applied to automated test can alleviate these growing test concerns. Pressure to deliver test systems faster with fewer resources shifts software strategies away from rigid, inflexible solutions in favour of software-based platforms to maximise longevity and scalability across a product’s lifecycle and across new product designs. The number of sensors in products has significantly increased, challenging test managers to keep up with new technologies and adapt to this growing need. Test managers need agile test solutions they can change as quickly as the sensor-integrated products they test. Automated Test Outlook 2014 is based on academic and industry research, user forums and surveys, business intelligence and customer advisory board reviews. What does the future hold for electric drives in the industrial automation sector? Currently there are three trends which are dictating development – speed and ease of specification, simplified control and maintenance, and machinery safety. Here, Nigel Dawson, Festo GB’s Product Manager for Electric Drives, looks at these trends. Today’s consumers expect their products, however sophisticated, to be intuitive, readily available, and quick and safe to use. The iPad is a great example; as soon as you take it out of the box, you know how to charge it, switch it on and hey presto you’re up and running in no time at all. What’s more, if you’re a technological Luddite or need help setting it up, there’s simple online support or you can call the hotline for step-by-step assistance. This expectation has spread into the industrial world: design engineers and machine builders expect Festo to have products that are easy to specify, for the control technology to be simple, for the maintenance to be straightforward and for the products to adhere to the latest safety legislation. 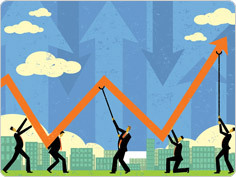 So how can vendors help to reduce the time taken to dimension and select the product? Just as the iPad is quick and easy to select, buy and get up and running, so should electric drives be. Festo has responded to these demands with the introduction of its ‘Optimised Motion Series’, which is a range of electric drives based on those easily accessible and easy to use iPad principles. The intuitive online configuration tool assists in the specification and selection process and for easier sizing a range of pre-defined and tested combinations with all of the necessary data is available. For easier ordering, a complete drive solution – comprising mechanical system, motor and motor controller – is available with just a single part number. And, for easier assembly, the motor and mechanical system is integrated. Web brower technology will simplify control technology and handling of electric drives in the future! The second trend is for simplified control and maintenance and web browser technology is at work here; it allows the user to source electric drives that are easy to commission, programme and maintain. The demand from the end user is that electric drives have to be intuitive and they don’t want to have to buy specialist programming cables and software. A standard Ethernet CAT5 cable, which is relatively cheap and readily available, will connect straight into the controller from the laptop and, using a web browser, type in the IP address of the controller, which has its own web page on-board, to commission it (as you would when setting up your own home router). 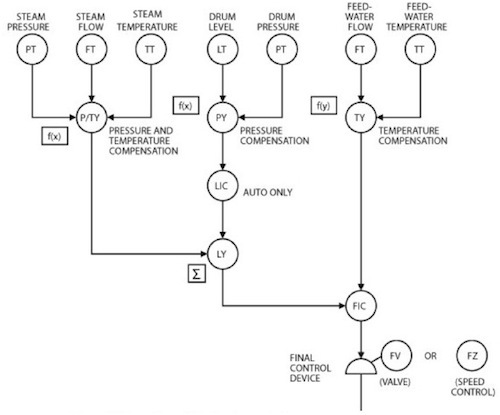 This web-based configuration makes control simple too as it is based on the basic principles of solenoid valve technology. The diagnostic function, accessed via a standard web browser, supports simplified maintenance. The final trend which is influencing the sector is machinery safety. But, the issue here is that the machinery safety industry is focused on electrically and electronically monitored systems that end at the motor. The question is who is monitoring the mechanics? Here, Festo have developed a unique overall safety concept integrating clamping modules and linear feedback systems onto its popular EGC axis. These mechanical measures, combined with safety functions in the drives and motors and specific electric drive safety controllers allow customers to create fully certified systems for category 4 / PLe safety from a single supplier with full documentation and circuit diagrams. By understanding these three trends, Festo is opening up new possibilities in industrial automation, making it easier for machine builders and design engineers alike to specify, control and maintain electric drives while ensuring they comply with the latest safety legislation. Ultimately, machine builders can improve motion control and profit margins, as well as make significant cost savings on integration. State of control and safety in manufacturing and power generating industries! This paper was written by a team at Premier Farnell. Premier Farnell is a distributor of electronics technology. The power generation industry has gone through many changes in the last 50 years or so and the controls and safety features that were based primarily on the pneumatic controls are now taken over by electronic controls (with its own set of integrated systems resistors, and capacitors) and/or the Digital Control Systems, Furnace safeguard Supervisory Systems (FSSS) and computer controlled systems. The automation systems have improved over the years and now a standard has emerged for the power generating industries. The general improvements in the systems can be enumerated as below. The systems in a boiler control are generally divided in five sections; wiz, drum level controls, steam temperature control, boiler pressure controls, and furnace safeguard Supervisory Systems (FSSS) as also auxiliary interlocks; apart from the boiler water chemistry control. The boiler water chemistry is a separate control not normally associated with other controls and will not be discussed here. Earlier the controls were based on water level in the drum. Sometimes when the steam demand went down the decrease in water level (because of increase of pressure) would tend to supply more water to the drum. This anomaly was rectified by the introduction of a three level control for the boiler drum. 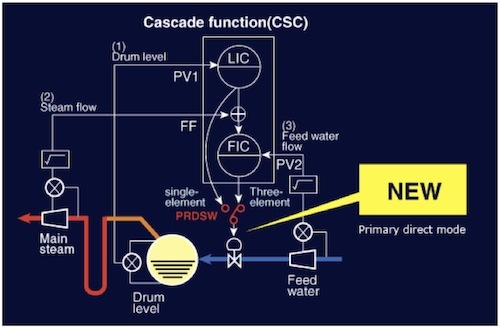 In the new system, the difference in the steam flow and the water flow was the main element for control of drum level with correction from drum level adding to the better control. The drum level system can be independent control with its own electronic controls consisting of resisters transistors and capacitors or integrated circuits. The system was further refined with pressure and temperature correction from steam parameters. This resulted in better management of drum level. The three element control with the compensation has not undergone any major change over the last 50 years and is now the industry standard. The pressure control has changed from just pressure control to the addition of other parameters like air flow, fuel flow, and the fuel calorific value for pressure control. 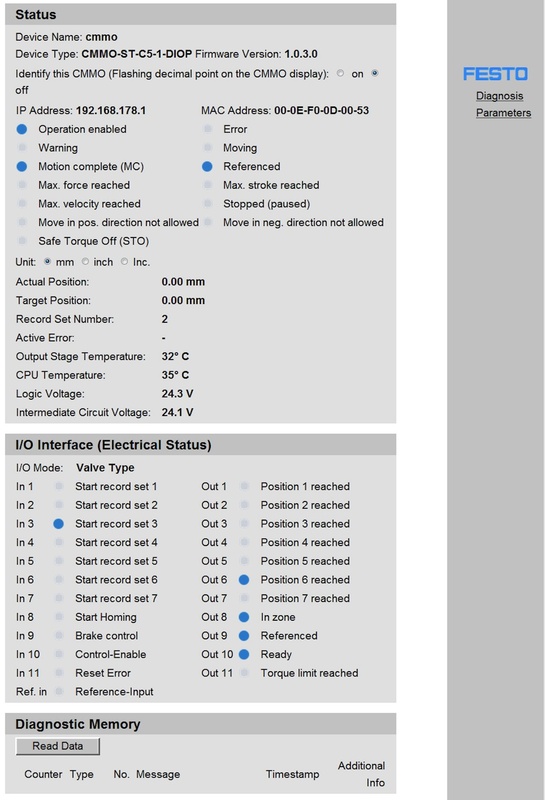 The online efficiency calculations are also now integrated along with fuel pressure controls. The primary air, secondary air measurements also assists the control of boiler pressure in the system. Stopping of all fuel to boiler when flame is extinguished or no longer detected. FSSS has three units, wiz indicating and operator’s console, relay and logic cabinet with its own electronic circuits of transistors, resistors and capacitors, relays, timers, AC and DC supplies and the fuel trip system. The steam temperature controls ensure that the metals used in construction of the boiler are below the safe limits under which they can operate. 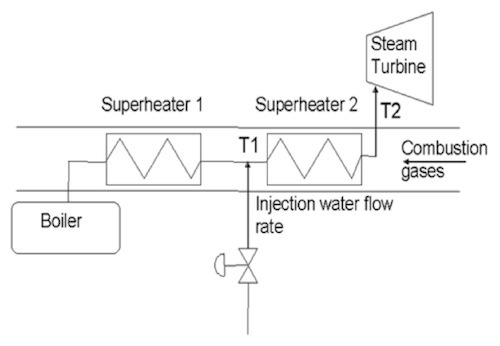 The control of steam temperature can be achieved by many means, but the most effective control is achieved by attemperation of steam in the area between the primary and the secondary superheaters. Any increase of temperature can affect the life of parts and may even cause failure of metals of the final superheater. Boiler alarm panels that were previously hard wired have started to become much more sophisticated panels. For example, previously changing alarm settings was only possible with the help of an instrument engineer, now the operator of the panel is able to fine tune the alarm setting. All these systems were operated as independent systems with no outside communication. These were known as single loop controllers with their own logic. The trip systems operated independently and had no effect on the other entities in a power plant like the turbine, generator or the electrical systems. Additional reliability was introduced with the help of two out of three systems of primary sensing elements. With all of them agreeing on the value of the sensing element, the average value was used for control. When one of them gave a value beyond a permissible error, it was ignored and the other two were used for calculations and an alarm about the third one going out of service was given to the operator. This increased the reliability of the system, something that was not possible with the pneumatic systems. Other systems like the water management and fire fighting systems could not be integrated with the overall systems, even though operators could get information through hard wired systems. In emergencies, some of these systems were often ignored, resulting in less than ideal ways of handling the emergency. 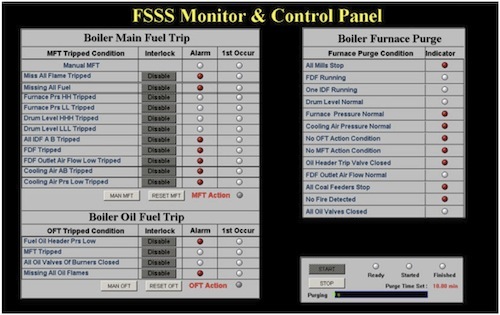 The next major change was the introduction of a Digital Control System (DCS) and the use of software in the boiler control system. 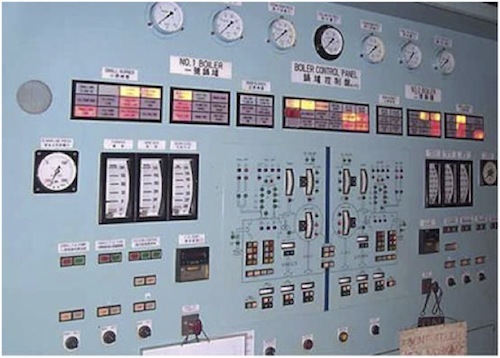 All the above controls were previously independent of one another, but the introduction of DCS and computer software in alarm and emergency handling systems brought the safe shut down of the boiler, turbine and generator. The system of programmable logic controls and the mechanical relays for protection of generators slowly gave rise to the electronic relays in electrical systems and its integration with the DCS. The architecture of the DCS is local control supervised by additional layers that overlook the entire system. 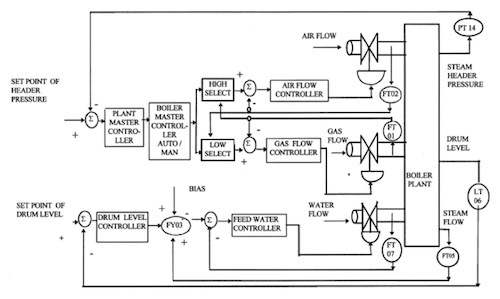 The individual control level of the drum, pressure control, FSSS of boiler, as well as the control of auxiliary interlocks turbine and generator protection, are individual systems which have their own logics and system of alarm generation for decentralized controls, but the information is sent to a higher level where the safety system takes over in emergencies. In case of emergency situations in individual areas, the system can have its own set of controls over the change in parameters to handle the situation. The safety of the entire system takes precedence over the individual systems and the safe shutdown of the entire system gets activated. While the individual controls are meant for the control of a single parameter, the alarm system signals the operator about the abnormal condition. The operator can take over the situation and bring the system back to normal. In case the operator is unable to do so and the situation threatens to get out of hand, the shutdown system comes into play. At this stage the operator cannot have any involvement and can only oversee the system shutting down safely. Overall, the change from individual controls, to dedicated single loop controllers with redundant sensing elements to the DCS formed the line of change to the present method of state of control and safety in manufacturing and power generating industries. 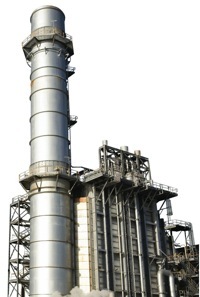 Optimising performance for power plant boilers. Steam plant operators are looking for control solutions that will help them to optimize boiler efficiency by reducing fuel consumption while reducing emissions. GE Intelligent Platforms can meet these needs for plants under 300MW with high performance, productized control solutions based on decades of domain expertise in steam cycle generation management that can reduce fuel usage while allowing boilers to run safely and efficiently. GE’s Steam Cycle control solution is based on a flexible and scalable DCS, Proficy® Process Systems, along with productized pre-packaged advanced combustion control algorithms and strategies for fossil and biomass fuels based on more than 30 years of GE Services experience to achieve significant operational benefits and mitigate risk. These advanced combustion control algorithms and strategies optimise the combustion process to reduce customers’ fuel usage 3% to 5% which allows them to better meet stringent emissions regulations. In addition, they keep equipment safe and protected by maintaining the water level in the boiler to prevent damage. Because these control algorithms and strategies are pre-engineered, they are capable of reducing system implementation time by 50% to 80%. The control system is able to handle conventional fossil fuels as well as the more difficult to control biomass and waste fuels. For biomass fuel plants, the natural variations in the quality and moisture content of the feedstock can results in steam production fluctuations. The system’s BTU combustion compensation control strategies ensure smooth and consistent steam production regardless of these variations. The system facilitates balancing combustion load when grates need to be offline for cleaning and when they are returned to service. Steam Cycle solutions also give customers the ongoing benefits of reduced fuel use and emissions, lessening the impact of their energy production on the environment. In fact, to comply with emissions regulations and reduce the environmental footprint, combustion factors and emissions levels can easily be captured and analyzed in real-time. The system’s features meet the stringent guidelines of GE’s ecomagination program and therefore it was named an ecomagination product earlier this year.